This 316L Surgical Steel barbell features a .925 Sterling silver charm. The gauge of the steel stem is 1.2mm (micro barbell), designed for fitting into eyebrow piercings that are 1.2mm in size. The length options are 8mm and 10mm. 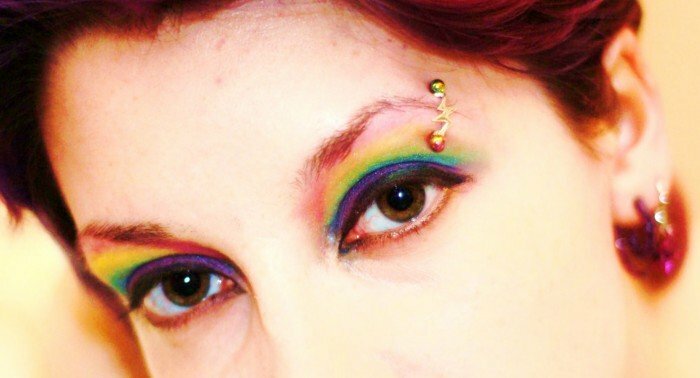 Please ensure you select the correct size for your eyebrow piercing. These barbell charms are such a great idea. I've never seen anyone else with one and they are such a stunning way to show off your eyebrow piercing. It took me some time to choose between them but I settled on the funky and eye-catching lightning bolt. It's true I struggled to put it together at first, so I wouldn't recommend them for an unhealed piercing or you'll end up aggravating it. But now it's in, I don't want to take it out! Important: carefully measure the space between your surface piercing holes and make sure you choose a barbell that is long enough or a little longer. If it's too short it definitely won't go together because of the way the charm hooks on before the balls. Very happy with this purchase, fantastic item! I found it a little complicated to put in at a first but once i figure it out it was easy :) and i've been complimented on it several times which i'm really pleased about. Great piece and really unique. Its perfect. and so unique, its not the sort of thing that people can look at and say oh have that aswell!